We&apos;re starting to see more and more leaks appear about the rumored Huawei Mate 20 and Mate 20 Pro, with the latest leaks pointing towards upgrades for the latter in the screen and biometric departments. First up comes a rumor that says Huawei will finally adopt a qhd resolution for the mate 20 Pro, with the Mate 10 Pro packing &apos;only&apos; a Full HD display. It seems pretty legit, as Dutch site MobielKopen has spotted code on Huawei&apos;s own website that looks to confirm a 1440 x 3120 resolution of the huawei Mate 20 Pro, while the Mate 20 may get stuck with a full HD resolution. This would be a reversal of what we saw last year, with the Huawei Mate 10 boasting a QHD screen while the Mate 10 Pro made do with Full HD. The same leak suggests the Huawei Mate 20 pro will also boast a gigantic 6.9-inch display, while the Mate 20 will pack a still-large 6.3-inch screen. This does gel with leaked shots claiming to show the front glass of the handsets, which do look big in the hand. There are also rumors that the Huawei Mate 20 Pro could have a square, triple-camera setup on its rear, and a picture posted to Chinese micro-blogging site Weibo appears to confirm just that. The image, posted alongside the message of just &apos;Mate 20&apos;, shows what looks like a press shot of the yet-to-be-announced handset - but we&apos;re not convinced. First up, the Huawei logo on the rear of the handset isn&apos;t centralized, which is a huge red flag that this is an edited image. Next up, the circular fingerprint scanner looks just a little bit too big for the phone, and finally there&apos;s the awful mess of the camera block. 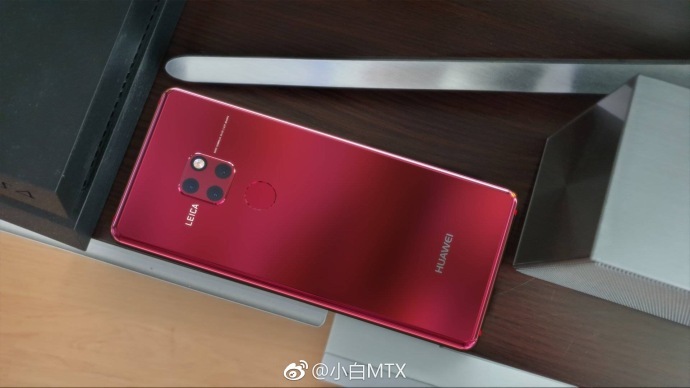 While this isn&apos;t the first time we&apos;ve seen rumors about this arrangement, it really doesn&apos;t look good here and we hope this is someone&apos;s poor editing rather than Huawei&apos;s design direction. If you look at the already announced Mate 20 Lite, it appears more likely that Huawei will go for a vertical stack of cameras and flash on its other two Mate 20 models, to ensure design continuity across the range. What we do know for sure is that the handset will be announced on October 16 in London, and TechRadar will be reporting live to bring you all the latest on Huawei&apos;s new handsets.